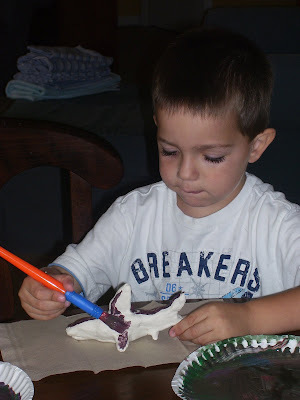 There is Owen painting his handmade shark. He decided that the shark was going to be multicolored, but mostly purple. Creative I say! I assisted in the modeling, but he informed me of all the fins needed, shape of the mouth, and we made sure everything was proportional. Great job Owen, I'm proud of your diligence!